This summer, the entire world will be going football mad when FIFA World Cup returns for an entire month of nail-biting games. London is getting in on the action with hundreds of screenings taking place across the city's bars, restaurants and pop-ups. Add to that a series of parties and football-related events and even those not jetting off to Russia for the occasion will be fully immersed in the action. So, for those who don't fancy standing behind a pillar in the local Wetherspoons, read on to discover the best places to watch the World Cup in London. 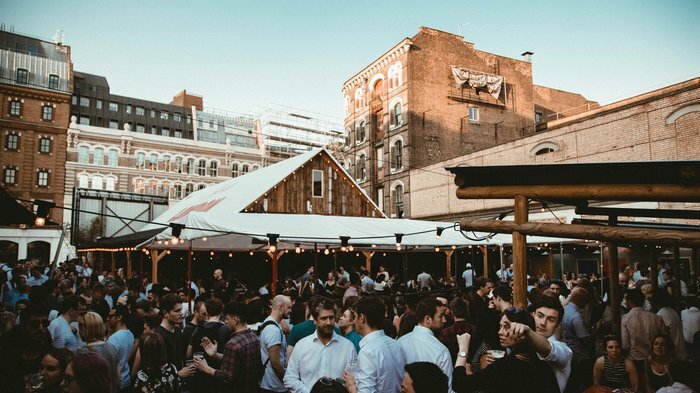 Taking over Flat Iron Square and Apres London, The Soccer Lounge is one of the best places to watch the World Cup in London. Outside, a massive outdoor screen in the garden courtyard will show every single game. Plus, in addition to all the numerous bars that are already there, there will be pop-up wine and prosecco bars and guest breweries. Inside, the Apres London ski lodge will have a 100 inch HD screen - the biggest in the Borough of Southwark - showing all the action. With seven screens spread across two rooms, Brigadiers is set to be one of the best places to watch the World Cup in London. In Blighters, a restaurant and bar with booth seating, guests will be able to enjoy and an Indian barbecue menu that utilises tandoors, charcoal grills, rotisseries, wood ovens and classic Indian smokers. Diners will feast on dishes such as goat tikki bun kebabs, fried fish tacos, a tandoori chicken club sandwich and tawa masala lobster and shrimp roll while watching the games on three screens. For a more casual experience, the Pool Room has four screens alongside a full-size pool table, a rare whisky vending machine and fast-pour self-serve beer taps. With 19 large plasma screens and projectors, food packages and Heineken Blades - the self-pouring beer taps - Greenwood is your go-to for the 2018 World Cup if you're in and around Victoria. The two floor pub within the Nova Victoria development also has a stylish Sports Lounge, available for exclusive hire, as well as shuffleboard, making it the perfect pitstop to catch all the action from Russia this summer. As well as a large central bar and plenty of seating, the spacious ground floor upstairs there's another bar with five screens, two of which are mega screens, showing all the big games and international sport, day and night. From 3rd May 2018, Skylight returns with croquet lawn games, World Cup screenings and Wimbledon on the big screen on top of Tobacco Dock. The summer season brings live entertainment, croquet, one-off parties, resident DJ collectives, rooftop yoga and some scenic sunsets. Set on the top three levels of a former car park in Wapping, the 600 capacity Skylight has multiple bars, indoor and outdoor seating areas, and two street food stalls, all set against some of the finest views in the city - you can see The Shard, The Gherkin and the Walkie Talkie from here. Grab a seat on the upper level for prime views and extended sun rays before enjoying a spectacular show of yellows, oranges and pinks when the sun sets in the shadow of London's most famous buildings. Food wise, visitors can choose between burgers and souvlaki with Flip Side and Yiro taking over the kitchens and a new refreshing seasonal cocktail menu has been added alongside spritzes, pitchers, bubbly and wine. Book in for a game of croquet on the upper deck or, if the British weather isn't on your side, there's two playing areas inside. If fancy footwork is more your style, try your hand at the digital penalty shootout. The much-loved Last Days of Shoreditch is back for its eighth year in 2018 with three months of street food, art, music, karaoke, and sport on one of the biggest screens in London - all of the England games will be shown as well as a number of others. 'The Enchanted Garden' sets the tone so you'll find a tropical beach area, swinging hammock beds and a tree-house at this summer hotspot. Expect summer cocktails and craft beer bars alongside street food from Seth Troxler's Smokey Tails, Cheeky Burger and pizza from Crust Bros. The dance floor is soundtracked by a star-studded DJ line-up. One of the many highlights is the return of the XOYO Saturday daytime takeovers throughout July with Late Nite Tuff Guy plus a who's who's of talent including Eli Escobar, Alexis Taylor, Dan Shake and Normay Jay. This summer, Boxpark Shoreditch and Croydon will be pitching up a big screen to show every one of the World Cup games. Tickets can be bought in advance and once guests are there they'll be able to settle in for a session of booze, food and, of course, footie. There will be no need to get up and down to the bar during the big game as both venues will be serving large jugs of any draft beer or cider. Additionally, there will be a tempting menu of food items at both sites. In Shoreditch, there's souvlaki, meatball loaded fries and Pieminister pies while in Croydon there's pizza, burgers and Moroccan fries. With post-match DJs, world music for each team, and party vibes, Juju's Bar and Stage is a good option for enjoying the atmosphere of the World Cup. In the heart of the Old Truman Brewery site, the bar offers Mezcal cocktail and al fresco dining while you watch the football from the comfort of a sofa or book in and get a table. Food offerings include a delicious dishes like Sticky Icky pork ribs, vegan Vietnamese tacos, 8oz teriyaki burgers and Buddha bowls courtesy of Chef Lee Cahu Le's pop up restaurant, the Chunky Buddha. Be immersed in the experience while enjoying the atmosphere of London's leading haven for arts and music. Showing all the games from Russia vs Saudi Arabia on Thursday 14th June to the World Cup Final on Sunday 15th July. Punters can catch all the action from the World Cup with coverage of England's biggest games at The Grand in Clapham, a beautiful, historic former music hall that's long been a byword for going out, disco dancing and - quite possibly - pulling. The south London landmark has teamed up with Budweiser so football heads can watch the games on the absolutely massive 24 foot screen and there's live music, DJ sets, photo booths, food and, of course, barrel loads of Budweiser. They're screening all of the England games on 18th June, 24th June and 28th June. The DJs spin alternative jazz tracks. Both Bounce branches - Farringdon and Old Street - will be screening every game during the World Cup but the main events will be eight special parties for their chosen featured country games. The Farringdon branch will show England, France, Australia and Germany while Old Street will screen England, Spain, Poland and Brazil. The featured country games will be shown on huge 12ft screens and the event will also offer brass band singing, special food and drink deals, full commentary, half time shows, specialised pizzas from your home nation country, and DJs before, at half time and after the games. For the featured games, they recommend asking to be put on the guest list to guarantee entry. Additionally, there will be a special World Cup disco every Saturday during the tournament. Using any excuse to host a party, The Water Poet joins in on the World Cup action with a vast number of screens - nine, to be exact - showing all the action. Placed throughout the pub and in the garden, plus a huge cinema screen in the cellar bar, there will be no chance of missing anything. There are bookable tables and private areas available, enabling you to guarantee a good spot, and a large range of beers and a food menu will be on offer. An open air space in the heart of Stratford, Pitch Stratford offers street food, screenings and drinks in a colourful outdoor space just a short walk from the station, making it an ideal place to watch the World Cup games. Entry to most games will be completely free while the most popular games will be charged at £5, which includes a drink on arrival. There are a number of options for groups, including premium tables with guaranteed seats in the three rows just in front of the 196 inch HD screen. For those who love music and football, the festival will be screening the final. Australian psych-rockers Tame Impala headline Citadel festival with CHVRCHES and The Horrors also on the excellent line up as the laid back one-day festival moves to a new West London location this July: Gunnersbury Park. As well as music on the main stage there's a good choice of alternative entertainment from dance and drawing to screen printing and children's workshops, fashion and beauty stalls, and fitness activities like disco dodgeball. Sunday Papers Live will be in attendance with invited speakers creating a forum for debate and Sharp's Brewery will be serving up their beers in a secret bar and giving festival goers the chance to try their hand at beer ping, a tasteful take on beer pong. Depending on the length of the men's Wimbledon final, the hotel will also screen the World Cup match. This Sunday, the South Place Hotel's Secret Garden will be screening the men's Wimbledon final and, depending on the length of the match, it may also show the World Cup final. Guests will be able to relax on a deckchair while sipping on the hotel's special Sipsmith Summer Cocktail, served with an Eton mess and a pot of Joe & Seph's gourmet strawberry and cream popcorn. Plus, if you're in for the long haul with a whole day of sport, you can get 25% off dinner at the Chop House. Tickets are £28 and include entry, the cocktail, pudding and popcorn. From cheap budget accommodation to luxury 5 star suites see our discounts for hotels, including Holiday Inn London Kensington Forum from 50% off.